I stumbled upon a recipe for corn baked in a soy-butter sauce and was intrigued. It was a yummy sounding combination, so, I wondered whether it will work for meat as well. I tried it on beef and was pleasantly surprised. It was delicious and pleasantly reminiscent of beef teppanyaki. Yes, scored gold with this experiment! For this bento, I prepared a single serving of the beef. 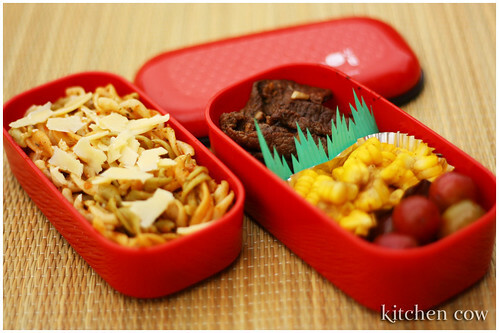 Since you don’t have to marinate the beef, it’s perfect for quick bento prep in the mornings. It takes less than 10 minutes to cook and even less time to eat it because I tend to gobble it all up. I love it that much. To go with it, I took some leftover corn, removed it from the cob then tossed it with some Cajun seasoning. I also added some grapes to nibble on. For my carb fix, I simply prepared some tri-colored fusilli, added some sundried tomato pesto, then topped it with some freshly shaven parmesan cheese. 1. Melt butter in a small frying pan. 3. Before it starts browning, throw in beef and sauté quickly. 4. Once it browns, add the soy sauce and continue stir-frying until done. This entry was posted in bento, recipes. Bookmark the permalink. Kao!!! I tried this recipe and it is sooo good! I couldn’t stop eating it! I almost took Jojo’s share! Ang sarap no? And it’s so easy! The savory-salty-rich combo is a killer. I use the sauce not just for beef but other stuff too, like mushrooms, veggies, etc, but beef is the bomb.